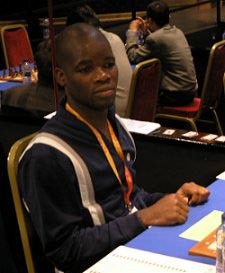 "Chess: Catarino Domingos Wins `Telecom' Cup," Angola Press Agency, 8 March 2005 (Luanda, Angola). National player Catarino Domingos, of Epal club, won on Sunday here "Telecom" Cup in chess, with 5,5 points, after a draw at the seventh and last round of the competition before the international and team mate Adérito Pedro. Thus, Adérito Pedro loses the title he won in 2004, having finished in the fifth position with five points and a progressive system of 19,5. Manuel Eduardo, Macovi chess school, was second with the same number of points as the winner, but with a progressive of 22,5 against 23 of Catarino Domingos, who won the title. Meanwhile, Abílio Ribeiro, of Catermar do Sumbe, with five points and a progressive of 22), Amorim Agnelo, Epal (progressive of 20,5) and Adérito Pedro, Epal, occupied the third, fourth and fifth places, respectively. The competition, played in a Swiss system in seven rounds, was attended by 30 chess players. The winner of the tournament, organised by Luanda's Chess Association, received USD 500, the second 400, third 300, fourth 200, fifth 150, sixth 100 and seventh 50 dollars. From the eighth to the 10th classified received 30 dollars each. The competition was organised to commemorate one more anniversary of the firm Angola Telecom.